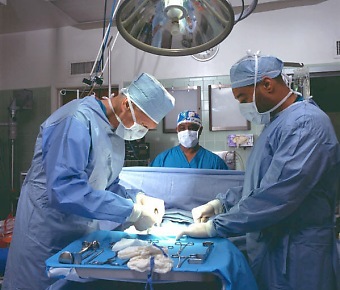 Surgeons in a hospital, it’s it public or private? Every time I hear the tv and radio heads discuss the current national healthcare legislation, both sides of the political aisle are overstating the real information. This isn’t the plan for us, it stinks. But this shouldn’t be the end of the discussion on SOME SORT OF STRATEGY either. I hear the mantra, “I don’t want anyone between me and my doctor!” and think of all the free market health policies that are highly restrictive. When there is a question of the viability of a particular procedure in your time of crisis you have to trust an insurance company review board to approve the continued coverage to keep you alive. Movies have been made about their bottom-line. Further, all policies have life-time limits of coverage (some amazingly low), and schedules of how much they are willing to pay hospitals and doctors for nearly every type of medical condition. If you are wealthy, none of this really matter, you can self-insure. What is so great about our current system? The current system costs too much, we all agree with that. The current system isn’t really a “free” market system since insurance companies can’t compete across state lines. The current system doesn’t accept new customers with pre-existing conditions, tough luck if you get sick BEFORE you can afford the insurance. The current system is class oriented too, meaning if you can afford the platinum policies you get the private rooms and best treament (others are relegated to second class status.) In fact, you get to be first in-line too. The current system allows people to sue doctors and hospitals to the point many are loathe to suggest the aggressive, often the best procedures, for fear of ending up in court if they don’t work. It’s a lie to say Americans don’t go to Canada for treatment, presuming this is evidence of their inferior system. Canada doesn’t have a system that even ALLOWS outsiders to show up and get treatment. It’s a lie to say Americans don’t go anywhere else for treatment too, we do. We go to nice hospitals in Mexico, Costa Rica, Brazil and Southeast Asia (to name a few) for inexpensive treatment (by comparison to the US costs) when we get turned down by insurance companies for coverage here. Recently we heard of Farah Fawcett’s amazing struggle to survive. Were you aware she spent two years in Germany getting treatment she couldn’t get state-side? So tell me, what is so great about our current system? Henry Ford didn’t invent the car, but he found a way to make it affordable to common folks. He tried and failed two times before figuring the assembly line concept out. But even his cars had hard rubber wheels, not like the ones of today. We didn’t invent national healthcare, but I’m sure we can build a better one. A system that will guarantee the sanctity of life through laws, not left to “Dead Boards” to decide. The right system will still provide a seat at the table for insurance companies too. They can provide the additional coverage for those who want additional protection for being unable to work while sick, or for medications, dental care, eye glasses and more. I don’t like the proposed system (referred to as Obamacare), in fact it scares me the more I find out about it, but my desire for change in this regard is growing.